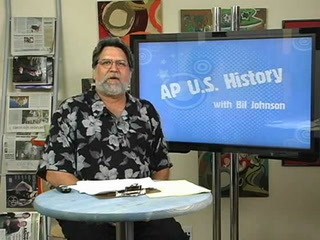 Hi I’m Bill Johnson and this is the first episode in our AP US History prep series. The real key thing that I want to make sure we get across in this is that the AP US history test shouldn’t be stressful it shouldn’t be anything that makes you crazy. So this first episode what we are going to do is just kind of set the table and set some ground rules that will really help us have fun with history because that’s really the purpose of this whole series. I really want people to think about having fun with history so one of the things that we need to do is to think about kind of that there is a big picture of history that there are certain elements when we study US history that we really want to pay attention to and we look at those big elements in a moment. We also of course because its history have to pay attention to a timeline to ideas like causing effect. And the real fun part of this episode I think is that we are going to look at how you can psyche out the multiple choice test there is like those 80 multiple choice questions on the US AP history. I know sometimes it really makes students a little crazy. But the fact is, you can really psyche it out and one way to do that is to become a history detective. If we think of history as mystery and we really act like detectives, we can psyche that out and have some fun with history. So in US history, in AP US history especially, there are some recurring things. There are issues, there are ideas, concepts that show up again and again and again. It’s really what I like to refer to as The big picture. And the big picture you can see here in this beautiful frame, really there are elements that you really need to pay attention to. Things like the constitution and the Supreme Court. Something that should kind of set out, it’s a red flag for you. Race relations, class and gender issues, the US and the world, sometimes called GO politics. The US as an emerging world power, these kinds of things show up again and again. And the presidency of course I’ll get back to this again and again in this series, because it’s really one of the lost significant aspects of the test. It’s something that can really help you prep for it. Of course history wouldn’t be history, if we didn’t talk about timelines. We’ve got to know some dates, we've got to know timelines. But the easiest way to do this, is to remember the idea of cause and effect. Cause and effect will help you learn your timelines better. So, for example on this abbreviated timeline, where we have 1607, where the James Town colony was found in Virginia in 1607. What did that cause? What was the effect? What did it lead to? Well by 1619 we know that James Town created a House of Burgesses and self government starts in the Virginia colony. We also know in 1619 the first slaves were brought to the Virginia colony. So the economic change but also, the peculiar institution of slavery gets hold in the Virginia colony. In 1620, we had the Mayflower landing in Plymouth. By 1630 the master at Bay colony has established itself as a major commercial colony in the new world. So what is the effect of that? One effect is by 1636, you’ve got Harvard University being founded. We’ve already got a major university being established in the colonies. We also have in 1636 Rodger Williams says I can’t deal with these messages was Bay colony any more, I’m leaving for Rhode island because they won’t allow me enough religious freedom. So cause and effect with your timeline. Most important thing we want to look at though, in this episode, is preparing for that multiple choice test. And some good detective work is really what will help us do that. Because the college board gives us a tremendous advantage by telling us, you can go to their website and see this, what percentage of questions are going to be asked about which periods of time. So if you look at last year’s test prep book, you’ll see that they told us they’ll be 16 questions on the pre-Columbus to 1789 period. They told us there would be 36 questions in the 1790 to 1914 period. And there would be 28 questions to the 1915 to the present period. Now if we know that, and we are good detectives. If we really apply some good detective work to this history, we can figure out exactly almost what’s going to be on the test. Because it is a fair test, they are not out to trip us out with trivia. 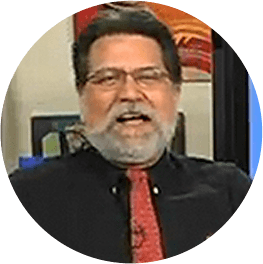 If we think about what would be the 16 most significant events of the development of the pre-Colombian to 1789 world and we dig through that, we can get a pretty good idea of what those questions are going to be, and prep for the test without any stress. So let’s put those ideas in action and take a look at how to be good history detectives. So here’s where we get to be detectives and we get to get into our textbook a little bit. But even before the textbook, let’s remember what we are doing here. Pre-Columbus to 1789, we said we know there are going to be 16 questions, and they are fair questions. Now what we are going to do, is look at our textbook pretty critically. We are going to look at this period, this pre-Columbus to 1789, and think about what would be the 16 items that probably would have to be asked. That would be fair questions, that would be most important about US history. But before we even look at the text book here’s what I’m going to challenge you to do and I’ll bet you can do pretty well on this. And that is, let’s think about what’s 16 things might be on there that we already know? Pre-Columbus to 1789. We probably know Declaration of Independence. And we can pretty much bet there is going to be a question about that. Connected to that of course is the Revolutionary War, and so we know that’s a good chance there is going to be some question about that. Maybe about what caused it or what effect it had. So a little bit of brainstorming beforehand can really help us here. We might want to think about who would some other people that we would have to know about. Obviously George Washington, Ben Franklin those kinds of names. So we might want to brainstorm first and come up with our own list of ideas of what might be there. And then, go to our textbooks. We’ll go and take a look at what’s in there. And let’s be smart about this. Let’s look at what are the titles to these chapters? What’s in bold print? Who do they have pictures of? And start to pull that out and put that next to our brainstorming list. And now, being these good history detectives we are, we are going to start to look at, okay what do we see here? What makes sense? What’s probably going to have to turn up on that test? And what I almost guarantee you is, if you go out and get a review book, and there is a number if good ones out there. But what I would recommend is that, you get a review book that has the most practice tests in it. Most review books have about two. But there are a couple out there. There is one that I know that has about 6 practice tests. And if you go to local book store and look, you may find that. But I would almost bet you that if you look at those practice tests, and you take a look for those 16 questions before pre-Columbus in 1789, your brainstorming list and your critical examination of your textbook list, those 1 items I'll guarantee that you'll probably come up with 10 or 12 just in this first time around. So think about if you just practice this, you pay attention, you act like a good detective over and over again by the time that AP history test rolls around, you are going to have those 16 questions down. So that you’ll nail that test. And it really is as simple as that. And that’s why you can really make this whole experience kind of a test stress free. And one where you will be having fun with history. So what we’ve seen is if we simply take a deep breath, and think about a few simple things. For example, if we think about the fact that it’s a fair test. The AP people are not out to get you. They want to see if you have knowledge about US history. So remember that it’s fair, and pay attention to that. Secondly, the big picture. If you think about the big picture of US history, and remember some of those elements that we pointed out that will show up again and again; The American presidency, The Supreme Court, The Constitution, The US and the world, The Geopolitics. If you think of that big picture, that will help you to kind of align your thinking and get you ready. Most significantly, what we looked at is how to psyche out that multiple choice test, and that's by being a detective. By being a good history detective, you can actually hit the books look at it critically. And really prepare yourself pretty well for those 80 multiple choice questions. In our next episode, we are going to look at how to get ready for the document-based question, which is really one of my favorite parts of the test. And I’ll explain that when I get to it. And then we will look at selected response essays, the free response essays. And future episodes, then we'll get a real content of those elements that we’ve talked about; The Constitution, The presidency and whatever. The key thing that I really want you to take away from this, and think about though is, the purpose of all of this is, US history is something that has to do with your life every day. And you really want to be having fun with history as much as possible. It’s not a stressful thing so go out there hit the books, and have some fun.